Columns configuration is specified by parameter columns and all settings are managed on its level. The header and footer are enabled by the parameters header and footer, correspondingly (by default, headers are enabled). The values of the attributes header and footer can be both string and object. In case of string, you can put into the header text labels, images, HTML inputs, and links. See the details in the related section. content - the built-in filter of a column (textFilter, selectFilter or any other from the list of filters). For more details, read the Headers and Footers article. To set widths of columns you should use the width attribute. The column with the "title" value will take all the free space of the container. If there are more than one column with the enabled fillspace attribute, they will divide the free space between them. In the above code the "title" column is 4 times bigger than the "id" one, which is 20 to 80 percent relation. true - searches for the widest item among data and header(s) and adjusts column width to its content. Pay attention that the resulting column's width won't be less than minWidth, in case this parameter is set for the column. In case of a large dataset, you can limit the number of rows that will take part in the calculation of the maximum column width with the help of the adjustBatch attribute of the column config. The property works in tandem with the adjust:"data" or adjust:true attributes. For more details, read the Sizing and resizing article. selectFilter - select filter. Retrieves values which contain mask defined through dropdown list of possible values. see the full list of available filters. A filter is set by the content property of the header attribute. For more details, read the Filtering article. You can also set a custom sorting type. The sorting is specified by attribute sort. For more details, read the Sorting article. Read more about using the css attribute in the Styling article. 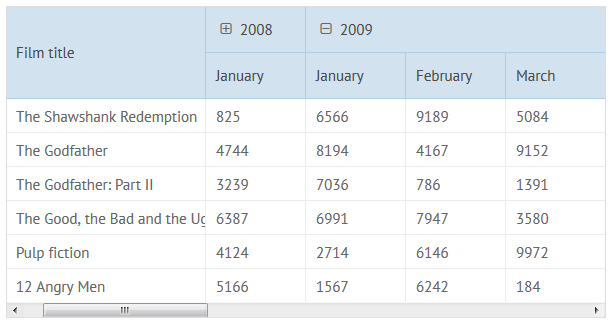 Formatting is applied to date and number values and defined for each column separately. To set some format for a column, use the format attribute. For more details, read the Number and Date formatting article. You can write simple math formulas to specify values in column cells. Formulas can be set for a whole column or for a single cell. For more details, read the Using Formulas article. The collection property of the column allows syncing column data with that of a DataCollection object or any data management component. Collection for the first column points to other datatable with "dash-pro" ID. With the help of this property you can also sync the datatable with various dataCollections. Through attribute template you can set a template of cells presentation corresponding to your needs. For more details, read the Data Templates article. Many aspects of a column can be customized to achieve the desired look-and-feel. Column style can be adjusted in a CSS class and applied through the css attribute. For more details, read the Styling article. Through the hideColumn() and showColumn() methods you can manipulate visibility of columns dynamically. array.removeAt() - removes an element from the array at the specific position. The functionality is available in Webix Pro edition only. colspan (number) - the number of columns in the group, including the aggregating one. Read more about colspans and rowspans in Webix datatable header. The feature is available in Webix Pro edition only. Datatable allows defining colspans and rowspans by span configuration provided with the dataset within the data property of the grid. To enable the rowspans and colspans functionality, you should set the spans parameter with the true value in the datatable configuration. To learn more on this topic, please visit the Datatable Rowspans and Colspans article.